We’ll be showing a number of historic Whitstable film clips from the notable Tony Blake Collection during our open meeting at the Castle from 7.15pm. All are welcome – and non-members too! Our next Open meeting will be at Whitstable Castle on Wednesday 18th July from 7.15pm. The speaker will be David Herren who will talk about the work of Tools With A Mission (TWAM), a Christian charity which collects unwanted tools, refurbishes them, sorts them into trade kits, and redistributes them to disadvantaged people in the developing world. This will be followed by our usual refreshment break and then discussion of current local topics. We expect this unusual subject to be a most interesting and enlightening topic and hope that many members will attend. Additionally, our open meetings are – as the name suggests – open to anyone. 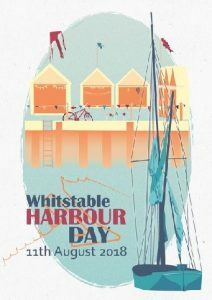 A town proud of its maritime heritage…..
Whitstable Maritime invites everyone to come and share in the fun of Harbour Day on 11th August as the town celebrates its connections with the sea, past, present and future. From 10.30 in the morning, the harbour quays will be packed with stalls, there is a full day’s programme of live music and drama on the stage, and craft old and new will be mooring in the basin. Over 250 volunteers will be helping visitors enjoy this annual maritime festival – and it is all free! Visitors will be able to clamber aboard the Border Force cutter, the In-shore Fisheries patrol boat, a cargo vessel, and the lifeboat. 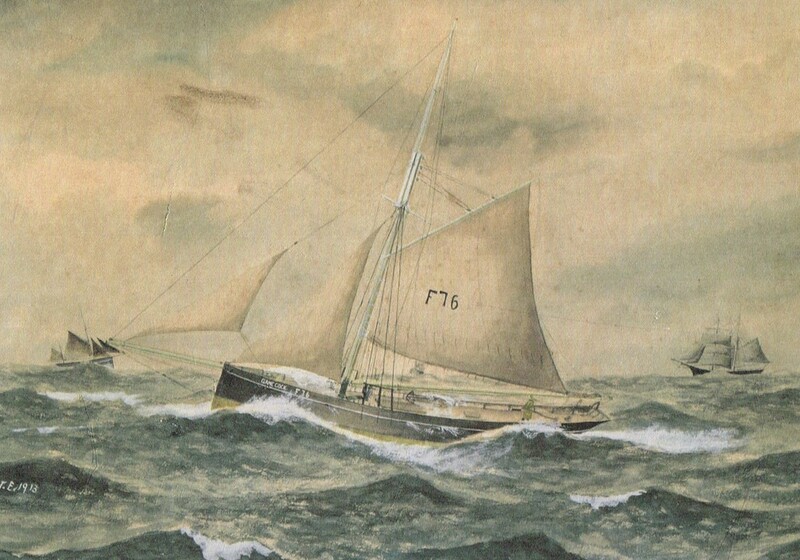 Barges and smacks, some over a hundred years old, will race against each other oﬀ-shore before returning to harbour. The stalls will reﬂect local maritime themes: from sea-food to family histories; from plastic pollu-tion to sea-defences; from sea-rescue to coastal walks; from boat-restoration to harbour rail-ways; from marine archaeology to coastal gardening; from marine conservation to yatching. Children of all ages will be able to navigate beautiful radio-controlled models of many of the local craft in a large pool and try their hand at rope-making before riding along the quay on a small-scale steam engine. Resident traders will be providing a range of food and drinks as well as gifts and collectables and local artists will oﬀer everyone an opportunity to be creative. It is truly a great day out for the family. On Harbour Day you can visit over 30 stalls celebrating Whitstable’s connections with the sea: past, present and future. Boat-building, lifeboats, model boats, sea trips, raft racing, a model railway, creative art workshops, coastal gardening, children’s drama, oral history, coastal walks, bird-watching, live music, and a barge/smack race offer a full day of activities and entertainment for all of the family. While there are food, drink and craft stalls for all tastes. Our fundraising efforts together with the Oval Preservation Community Group continue apace for the Oval Judicial Review scheduled for 13th to 15th December. 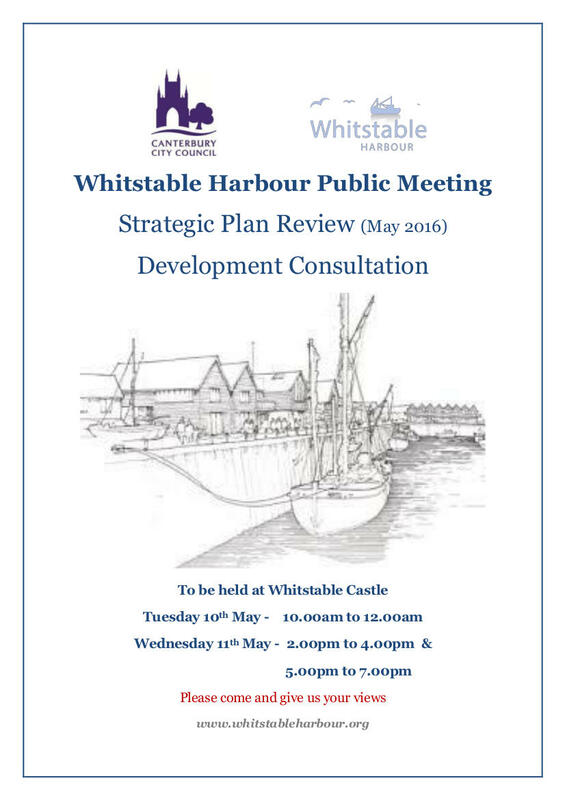 A new date has been added to this consultation and will be held at Whitstable Castle on Friday 27 May, 4-6pm and 7-9pm. Please note that despite being advertised as an exhibition, this is a presentation, so members wishing to attend should aim to get to the Castle at either 4.00 pm or 7.00 pm. We will be discussing this at our next meeting on May 18th. The consultation opens online with a hard copy being made available at the Harbour on the 13th May. There will be a PUBLIC MEETING: ‘What future 4 Kent’s libraries?’ in Whitstable on FRIDAY 15th May (10.30am to 12 Noon). It will be at St Peters Church in Sydenham Street and all Kent’s library users/supporters are invited. Author & Library Campaigner, Alan Gibbons, will be the guest speaker. KCC Leader, Paul Carter, has been invited to send a representative. Free including tea/coffee. This will be an opportunity to share library stories and have a say in what should happen next now that the KCC consultation and the ‘Save our public libraries’ petition have closed and we await responses from Kent County Council. Please invite friends and contacts from across Kent – this is a whole-county issue in which Whitstable has played a leading role.